Because of heavy snow fall in Munich the DLD13 art session started a little earlier than planned. 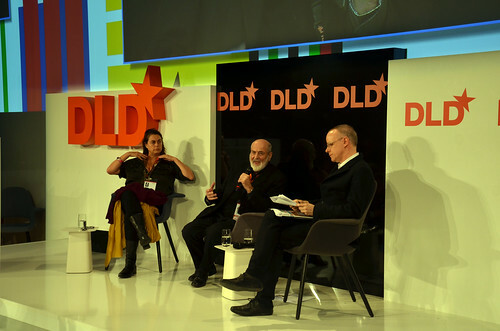 The first session is Hans Ulrich Obrist, co-director of the Serpentine Gallery in London, speaking to Michelangelo Pistoletto and Maja Hoffmann. Pistoletto is an Italian artist. Ever since his ‘Mirror Paintings’ (1961-1962), his work has been about connectivity – to viewers and beyond. Obrist asks Pistoletto about his some of his projects, including the Cittadellarte-Fondazione and his latest project, The Third Paradise. Both are about an artist connecting to the world around him. But that is a two-way-street, meaning Pistoletto is also looking for people to connect to him. The Third Paradise sign consists of three circles. It was conceived as a new sign for infinity. “To understand the third paradise you have two understand the two paradises which came before,” says Pistoletto. “The natural paradise, where man and nature were completely connected, and the second paradise, where humans escaped nature.” The third paradise represents the connection before the prior two, meaning it is the connection between nature and artifact. Commerating this new stage, Pistoletto came up with Rebirth-day, which took place on the 21st of December. Many people participated, and the outcomes of this first collaboration will go online over the next few days. “I hope you can all join Michelangelo in making this the biggest artwork in the world,” Obricht says, just before Pistoletto leaves the stage. Next Obricht turns to Swiss-born Maja Hoffmann. Hoffmann is a contemporary art collector who supports of innovative projects. In 2004, Hoffmann founded the LUMA Foundation (Zurich), which is involved in planning a groundbreaking cultural site in the Parc des Ateliers in Arles (France). She reveals a series of images explaining this work in progress to the DLD13 audience. The endeavor is all about combining the old and the new, learning with creating, buildings with gardens. The slightly helter-skelter discussion featuring these two art-pushers has hopefully provided some inspiration for how art 3.0 could look.